Bengt R. Jonsson, Erikskrönikans diktare – ett försök till identifiering. (The author of Eric’s Chronicle – an attempt at identification.) Samlingar utgivna av Svenska fornskriftsällskapet. Serie 1. Svenska skrifter 94. Uppsala 2010. 321 pp. ISBN 978-91-976118-6-2. The primary aim of this book is to attempt to identify the author of Eric’s Chronicle. Previous argumentation regarding who commissioned the Chronicle has not been impartial, which has also obscured the issue of its authorship. Here it is argued that the instigator was lawspeaker Birger Persson, father of Saint Bridget. With regard to the issue of authorship, the general opinion has been that the author was to be found within the circle close to Duke Eric and Duke Valdemar. Despite this, no researcher has previously considered the solution that lies closest to hand, namely that the author was the Duke’s own secretary. His name was Tyrgils Kristineson. The identity and contacts of the chronicler has been determined using genealogical methods. Tyrgils was a canon in Skara and Växjö, son of a priest and an unmarried woman through whom he was a member of a prominent circle of relatives. Through his mother he was related to several persons who play an important part in Eric’s Chronicle, which throws new light on several aspects of its configuation. Canon Tyrgils’ position as the Dukes’ secretary has similar significance. The interest shown by Dutchess Ingeborg has considerable significance for the genesis of the Chronicle, although Birger Persson was the actual instigator. It is probable that Tyrgils left his post with Ingeborg in 1324 and therefore was provided with the time between 1325 and 1326 to compose the Chronicle. The fact that several characteristics support an origin in Uppland and others an origin in Västergötland is to be explained by the commissioner being lawspeaker Birger Persson from Uppland, and author Canon Tyrgils, from Västergötland. A large part of this book is dedicated to clarifying the manner in which the manuscripts containing Eric’s Chronicle, that is to say Cod. Holm. D 4, D 4 a, D 3 (and D 2), have been passed down. Using detailed genealogical argumentation, the passage of the important manuscripts is followed from generation to generation up to the 17th century. Gustav Algotsson (Sture) emerges as a central figure. D 4 (which section of the Chronicle was later excised) was written for him. He was married to Märta Ulfsdotter (Sparre av Hjulsta and Ängsö) for whom D4 a was written with content which is similar to that of D 4. D 3 was subsequently written for their daughter, Elin Gustavsdotter. His first wife, Elin Arvidsdotter (Oxenstierna) was also of significance for the content of D 4. Thereto there is a relationship between Gustav’s two wives. Thereby it is clear that the central manuscripts and the Chronicle were handed down within the same family. 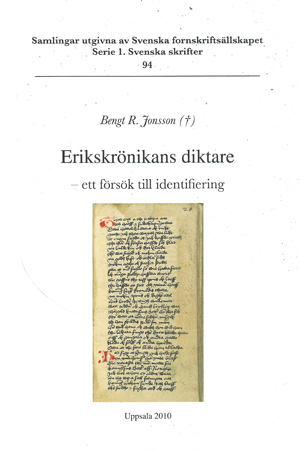 Keywords: Rhymed chronicles, determination of authorship, old Swedish, manuscript tradition, genealogy (medieval noble families), Scandinavian history.